No seams, a smoother rim, and no writing inside or out, for comfort and faster clean-up. - High capacity, angled suction holes, and aesthetically pleasing. - A slimmer, softer stem for your comfort, with a solid design to make insert/removal & cleaning simple. Why SckoonCup is BEGINNER's CHOICE Menstrual Cup? No Harsh Chemicals BPA & Latex Free. For women of all ages, even those with lower cervix! Do not hold back, stay active with SckoonCup, swim, dance, bike, hike & have fun. Size 1: Small, for women who haven't previously given birth vaginally. Capacity 23ml, SckoonCup size 1 is 1.6 inches in diameter, 1.6 inches in cup length, and the stem is 1.2 inches for a total length of 2.8 inches. SckoonCup is easily and painlessly inserted like a tampon. Due to the cup’s positioning lower in the cervix, SckoonCup can be comfortably used throughout the day with no sensation from the cup or its stem. Our advanced molding technology ensures SckoonCup’s outer curve is completely smooth and gradually thickens toward the rim. 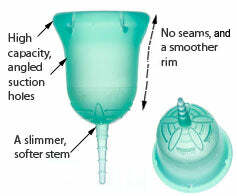 Other menstrual cups often have bumps around the rim, which may cause discomfort. SckoonCup is easier to clean and comfortable to insert & remove over other menstrual cups. SckoonCup is made in the USA of the highest quality, FDA approved medical-grade silicone. Since it’s soft, it’s easy to fold for insertion yet has enough spring to pop open easily once inserted. The slimmer, softer stem bends as your body moves so it won’t poke you, providing you with ultimate comfort. SckoonCup spent 3 years in R&D working with hundreds of women to improve the issues with existing menstrual cups. The result is a softer, smoother, smaller-yet-high capacity menstrual cup that many women report is more comfortable than tampons. Engineered for functionality and unparalleled comfort, Sckoon menstrual cup keeps your period simple, clean and worry-free. SckoonCup’s suction holes are part of the molding process – not added later by piercing the wall vertically – leaving the cup's outer wall surface completely smooth, without any sharp, uncomfortable edges or problems with clogging. They are designed to angle almost to the rim, allowing SckoonCup a higher capacity even if it feels smaller than other cups. SckoonCup is "CLEARED" by the FDA: For a menstrual cup to be “Cleared” by the FDA, they need to submit and Clear a “510(k) premarket notification“ a lengthy and expensive process of product inspections, and testing. FDA 510(k) clearance is a further assurance that a cup brand is good quality and in compliance with the FDA requirements for medical devices supported by Data Safety Sheets, Master Files that provide data on Biocompatibility and toxicity testing, and manufactured in ISO9001:2008 BSI American Certified Facility , as it has undergone testing/regulation processes. Sckooncup is "REGISTERED" with the FDA. This is an administrative process to just register the menstrual cup and the company selling it. All legal sellers must register, has nothing to do with Menstrual cup quality or testing. SckoonCup can be worn up to 12 hours, even on heavy days. We located the suction holes higher and angled them for maximum capacity, so you don’t have to worry about leaks. Free of synthetic fibers, bleach and dioxin, SckoonCup is a healthier and safer alternative to tampons. With SckoonCup, you don’t have to worry about Toxic-Shock Syndrome (TSS) or vaginal infections with proper use. And unlike tampons, SckoonCup doesn’t absorb moisture, which can cause dryness and discomfort. Sometimes, it’s like your period is there to thwart you… you want to show off your new bikini at that pool party, but aren’t comfortable with tampons. With SckoonCup, you can feel confident hopping in the pool whenever you want.